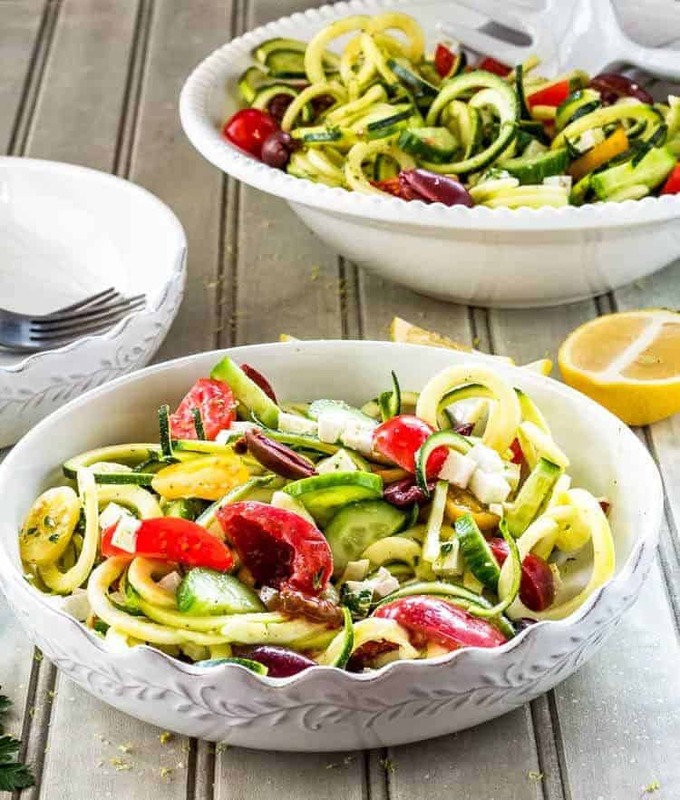 Greek Zoodle Salad has everything you love about a traditional Greek salad – salty feta cheese and kalamata olives, sweet tomatoes, crispy cucumbers, and tangy lemon dressing – all tossed with nutritious zucchini. 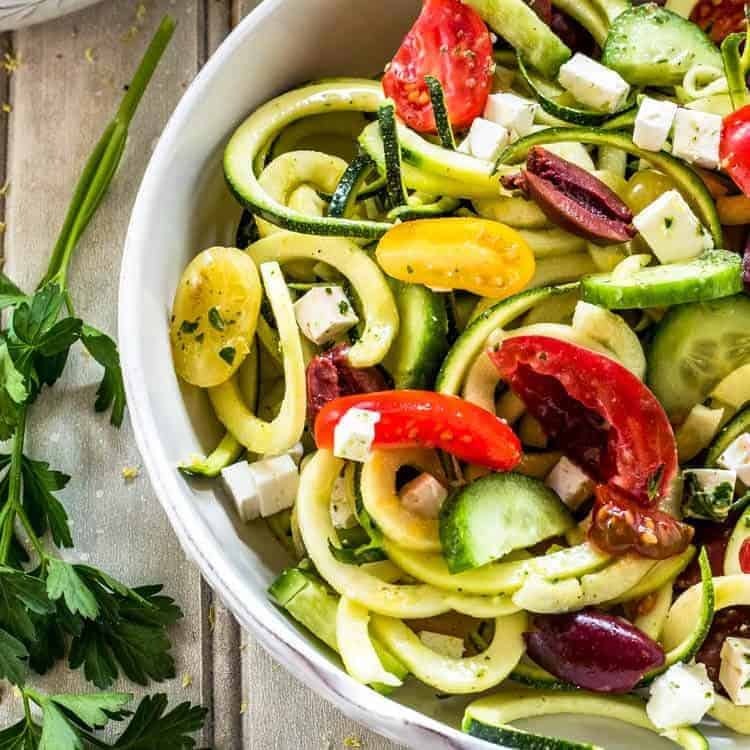 Get that spiralizer off the shelf, and in 15 minutes you’ll be enjoying this tasty Greek salad! Every cuisine has its signature or classic salad, right? Italians have the antipasto salad (cured meat, cheese, olives, peperoncini), Middle Eastern cooks have fattoush (leftover bread salad with seasonal produce and a zesty vinaigrette), Persians have the salad shirazi (cucumbers and tomatoes), Greeks have, well, Greek salad… I would venture to guess most of us know (and love?) a good Greek salad, and are terribly disappointed when it is just mediocre. Key to a good Greek salad is its ingredients: Sheep’s milk feta (much better than the cheater cow’s milk feta often found in U.S. markets! ), kalamata olives (please don’t use canned black olives! ), vine ripened tomatoes (not grocery store cardboard tomatoes! ), and crisp cucumbers. These simple ingredients are best complemented by the simplest of dressings – fresh lemon juice, good olive oil, and a bit of fresh oregano. That. Is. All. Your Greek salad may be on crisp romaine – very typical in the U.S. – or not. I have had many a fabulous Greek salad that wasn’t served with greens. P.S. 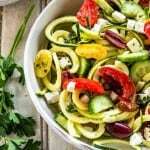 This Greek Zoodle Salad would be perfect with my Greek Lamb Pizza, or my Greek Lamb Patties with Yogurt Sauce and Bulgur Pilaf! 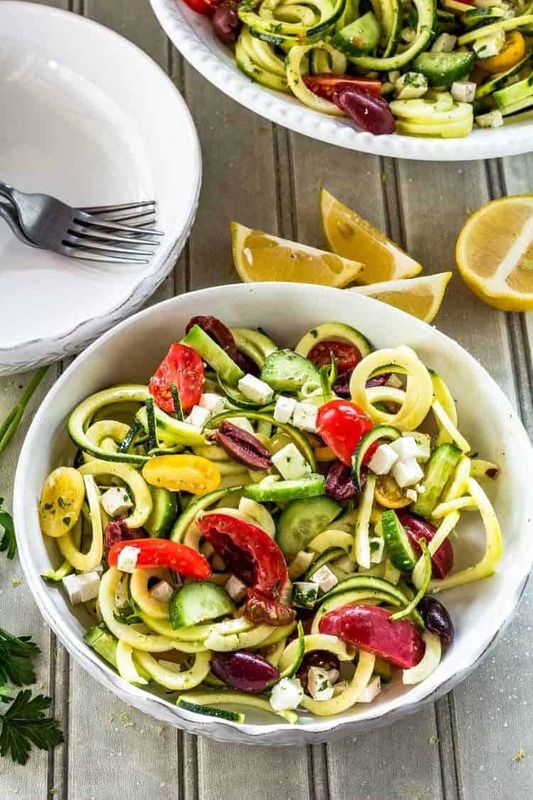 Greek Zoodle Salad has everything you love about a traditional Greek salad - salty feta cheese and kalamata olives, sweet tomatoes, crispy cucumbers, and tangy lemon dressing - all tossed with nutritious zucchini. Shake the lemon dressing ingredients together in a jar or cruet. Pour the lemon dressing over the salad. Toss gently to combine. Enjoy! With a grilled chicken breast, my husband and I will split this salad. If you round out the meal with pilaf or another side, you may stretch it to 4 servings... A lot depends on the size of the zucchini. I've been loving the baby English cucumbers for this salad! The skin is thin and tender, so I leave it on. Choose your favorite cucumbers, and peel them if you wish. Vary this according to your preferences. You might like thin-sliced red onion and bell pepper. As mentioned in the post, the key to a good Greek salad is the quality of its ingredients. Use sheep's milk feta, good quality olive oil, fresh lemon juice, kalamatas not black olives, etc. Keep in mind the feta and olives are salty. You may not want any additional salt. Macronutrients (approximation from MyFitnessPal) based on 4 servings: 293 calories; 12 g protein; 14 g carbohydrates; 21 g fat. Keep in mind most of the fat comes from the olive oil in the dressing, and some of that dressing remains in the bowl.